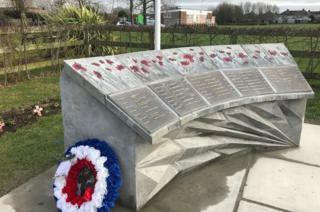 A town's new war memorial features for the first time the names of all those killed in the two world wars. The monument in Scotts Park, Patchway, South Gloucestershire, lists the names of 33 men from the town killed in World War One and 21 who died in World War Two. The memorial wall was made of concrete blocks created using 3D printed moulds. Mark Bryant, who designed it, said the servicemen were now "rightfully recognised in their hometown". The existing memorial cross, which stands next to the new creation, was relocated to Scott Park in 2015 after the closure of the British Legion club. The new memorial's base has been mounted with decorative poppy panels, with 54 glass poppies - one for each serviceman. The new memorial was officially unveiled by the town's mayor, Elaine Martin.